Athens, with its strong Aegean orientation, had shown itself hospitable to the eastern Greek style of building from the mid-fifth century on, and the finest surviving examples of the Ionic order are to be found among the structures of the Acropolis. The previous development of the order is known only in very fragmentary fashion. Of the huge Ionic temples that were erected in Archaic times on Samos and at Ephesus, little has survived except the plans. The Ionic vocabulary, however, seems to have remained fairly fluid, with strong affinities to the Near East (see figs. 112 and 113), and it did not really become an order in the strict sense until the Classical period. Even then it continued to be rather more flexible than the Doric order. Its most striking feature is the Ionic column, which differs from the Doric not only in body but also in spirit (see fig. 165). It rests on an ornately profiled base of its own. The shaft is more slender, and there is less tapering and entasis. The capital shows a large double scroll, or volute, between the echinus and abacus, which projects strongly beyond the width of the shaft. That these details add up to an entity very distinct from the Doric column becomes clear as soon as we turn from the diagram to an actual building (fig. 180). How shall we define it? The Ionic column is lighter and more graceful than its mainland cousin. It lacks the latter's muscular quality. Instead, it evokes a growing plant, something like a formalized palm tree. This vegetal analogy is not sheer fancy, for we have early ancestors, or relatives, of the Ionic capital that bear it out (fig. 178). If we were to pursue these plantlike columns all the way back to their point of origin, we would eventually find ourselves at Saqqara, where we encounter not only "proto-Doric" supports but also the wonderfully graceful papyrus half-columns of figure 60. with their curved, flaring capitals. 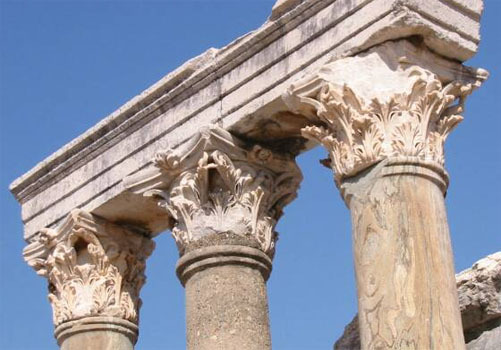 It may well be, then, that the form of the Ionic column, too, had its ultimate source in Egypt, but instead of reaching Greece by sea, as we suppose the proto-Doric column did, it traveled a slow and tortuous path by land through Syria and Asia Minor. 178. 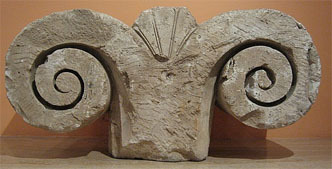 Aeolian capital, from Larissa. Aeolic Capitol, Smyrna, 570 B.C. In pre-Classical times, the only Ionic structures on the Greek mainland had been the small treasuries built by eastern Greek states at Delphi in the regional styles (see fig. 160). 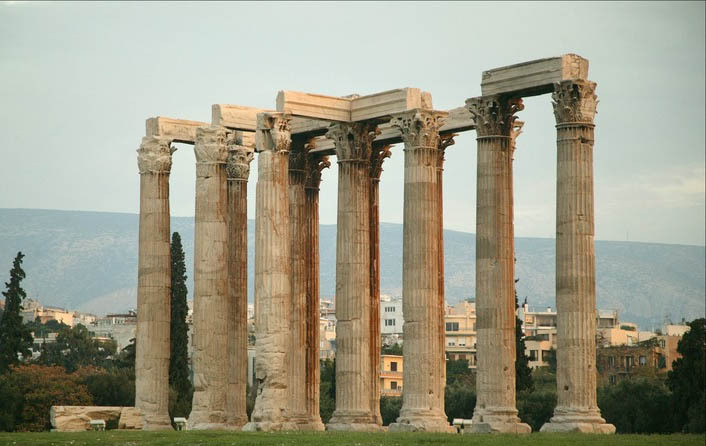 Hence the Athenian architects who took up the Ionic order about 450 B.C. at first thought of it as suitable only for small temples of simple plan. Such a building is the little Temple of Athena Nike on the southern flank of the Propylaea (fig. 177), probably built between 427 and 424 B.C. from a design prepared twenty years earlier by Callicrates. 180. The Erechtheum (view from the south), Acropolis, Athens. 421-405 B.C. Larger and more complex is the Erechtheum (fig. 180 and plan, fig. 174) on the northern edge of the Acropolis opposite the Parthenon. It was erected between 421 and 405 B.C., perhaps by Mnesicles. Like the Propylaea, it is masterfully adapted to an irregular, sloping site. The area had various associations with the mythical founding of Athens, so that the Erechtheum was actually a "portmanteau" sanctuary with several religious functions. Its name derives from Erechtheus, a legendary king of Athens. It may have covered the spot where a contest between Athena and Poseidon was believed to have taken place. The eastern room was dedicated to Athena Polias (Athena the city goddess). Apparently there were four rooms, in addition to a basement on the western side, but their exact purpose is under dispute. Instead of a west facade, the Erechtheum has two porches attached to its flanks, a very large one facing north and a small one toward the Parthenon. The latter is the famous Porch of the Maidens (fig. 181), so named because its roof is supported by six female figures (caryatids) on a high parapet, instead of regular columns (compare fig. 160). Here the exquisite refinement of the Ionic order conveys what Vitruvius might have called a "feminine" quality, compared with the "masculinity" of the Parthenon across the way. 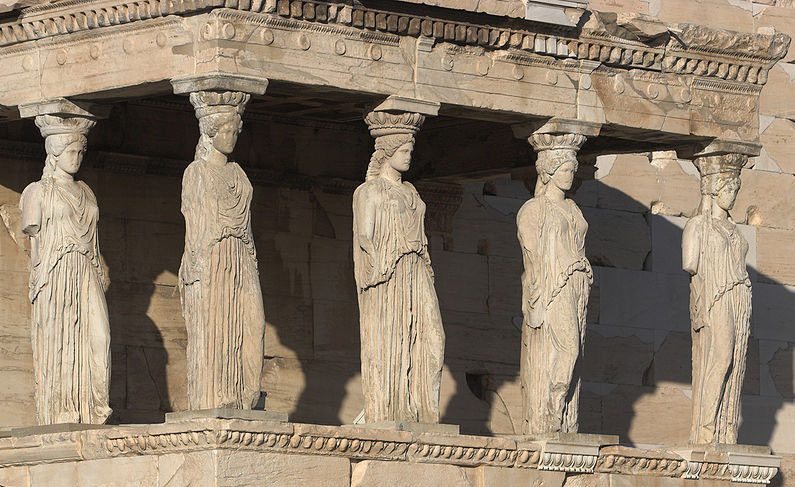 Apart from the caryatids, sculptural decoration on the Erechtheum was confined to the frieze, of which very little survives. The pediments remained bare, perhaps for lack of funds at the end of the Peloponnesian War. However, the ornamental carving on the bases and capitals of the columns, and on the frames of doorways and windows, is extraordinarily delicate and rich. Its cost, according to the accounts inscribed on the building, was higher than that of figure sculpture. Such emphasis on ornament seems characteristic of the late fifth century. 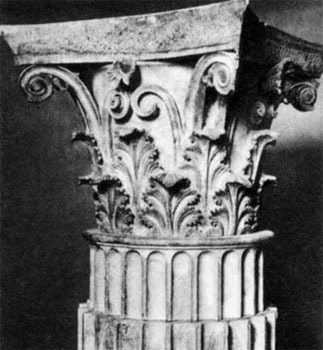 It was at this time that the Corinthian capital was invented as an elaborate substitute for the Ionic. (For a comparison of Doric, Ionic, and (Corinthian capitals, see fig. 165.) Its shape is that of an inverted bell covered with the curly shoots and leaves of the acanthus plant, which seem to sprout from the top of the column shaft (fig. 179). 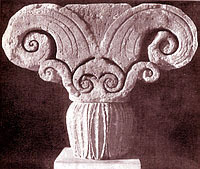 At first, Corinthian capitals were used only for interiors. Not until a century later do we find them replacing Ionic capitals on the exterior. 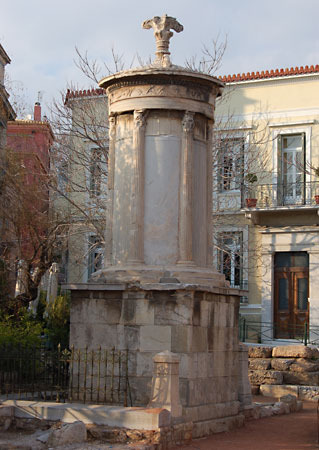 The earliest known instance is the Monument of Lysicrates in Athens (fig. 182), built soon after 334 B.C. It is not really a building in the full sense of the term�the interior, though hollow, has no entrance�but an elaborate support for a tripod won by Lysicrates in a contest. The round structure, resting on a tall base, is a miniature version of a tholos, a type of circular building of which several earlier examples are known to have existed. The columns here are engaged rather than free-standing, to make the monument more compact. Soon after, the (Corinthian capital came to be employed on the exteriors of large buildings as well, and in Roman times it was the standard capital for almost any purpose. 182. The Monument of Lvsicrates, Athens, �. 334 B.C. and the Great Pergamum Altar (see figs. 213-15). Town planning on a rectangular grid pattern, first introduced at Miletus in the mid-fifth century, assumed new importance, as did the municipal halls (stoas) lining the marketplaces where the civic and commercial life of Greek towns was centered. Private houses, too, became larger and more ornate than before. Yet the architectural vocabulary, aesthetically as well as technically, remained essentially that of the temples of the late fifth century. 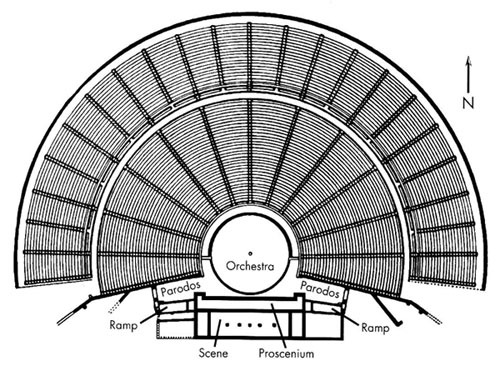 The basic repertory of Greek architecture increased in one respect only: the open-air theater achieved a regular, defined shape. Before the fourth century, the auditorium had simply-been a natural slope, preferably curved, equipped with stone benches. Now the hillside was provided with concentric rows of seats and with staircase-aisles at regular intervals, as at Epidaurus (figs. 183 and 184). In the center is the orchestra, where most of the action took place. 183. 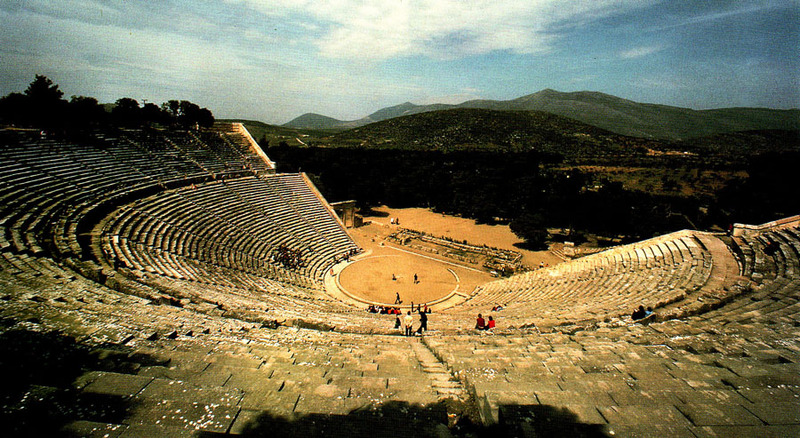 The Theater, Epidaurus. � 350 B.C. In the end, the greatest achievement of Greek architecture was much more than just beautiful buildings. Greek temples are governed by a structural logic that makes them look stable because of the precise arrangement of their parts. The Greeks tried to regulate their temples in accordance with nature's harmony by constructing them of measured units which were so proportioned that they would all be in perfect agreement. ("Perfect" was as signilicant an idea to the Greeks as "forever" was to the Egyptians.) Now architects could create organic unities, not by copying nature, not by divine inspiration, but by design. Thus their temples seem to be almost alive. 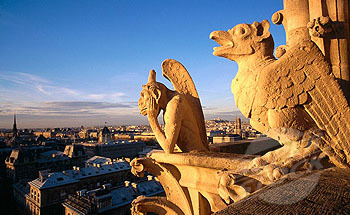 They achieved this triumph chiefly by expressing the structural forces active in buildings, known as architectonics. 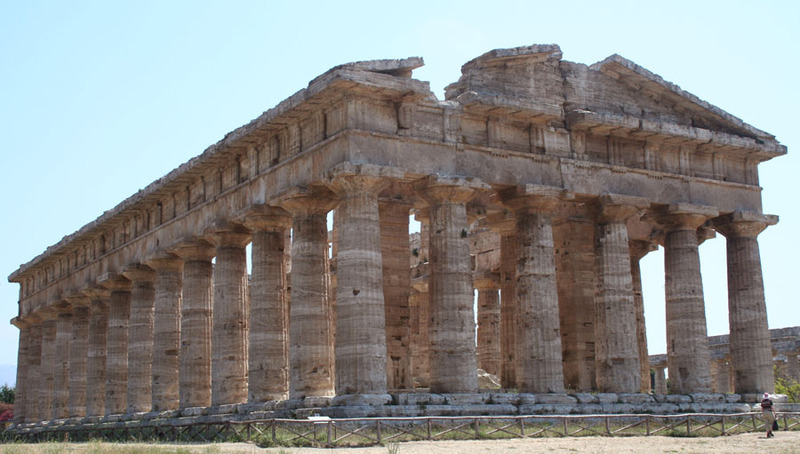 In the Classical period, expressions of force and counterforce in both Doric and Ionic temples were proportioned so exactly that their opposition produced the effect of a perfect balancing of forces and harmonizing of sizes and shapes. This, then, is the real reason why, for so many centuries, the orders have been considered the only true basis for beautiful architecture. They are so perfect that they could not be surpassed, only equaled. How are we to account tor the fact that Greek architecture did not grow significantly beyond the stage it had reached at the time of the Peloponnesian War? After all, neither intellectual life nor the work of sculptors and painters show any tendency toward staleness during the last 300 years of Greek civilization. Are we perhaps misjudging her architectural achievements after 400 B.C.? Or were there inherent limitations that prevented Greek architecture from continuing the pace of development it had maintained in Archaic and Classical times? A number of such limitations come to mind: the concern with monumental exteriors at the expense of interior space, the concentration of effort on temples of one particular type, and the lack of interest in any structural system more advanced than the post-and-lintel (uprights supporting horizontal beams). Until the late fifth century, these had all been positive advantages. Without them, the great masterpieces of the Periclean age would have been unthinkable. But the possibilities of the traditional Doric temple were nearly exhausted by then, as indicated by the attention lavished on expensive refinements. What Greek architecture needed after the Peloponnesian War was a breakthrough, a revival of the experimental spirit of the seventh century, that would create an interest in new building materials, vaulting, and interior space. What prevented the breakthrough? Could it have been the architectural orders, or rather the cast of mind that produced them? The suspicion will not go away that it was the very coherence and rigidity of these orders which made it impossible for Greek architects to break from the established pattern. What had been their great strength in earlier days became a tyranny. It remained for later ages to adapt the Greek orders to brick and concrete, to arched and vaulted construction. Such adaptation necessitated doing a certain amount of violence to the original character of the orders, something the Greeks, it seems, were incapable of.